Good for you for saving such a great car that would be beyond restoration for many folks. 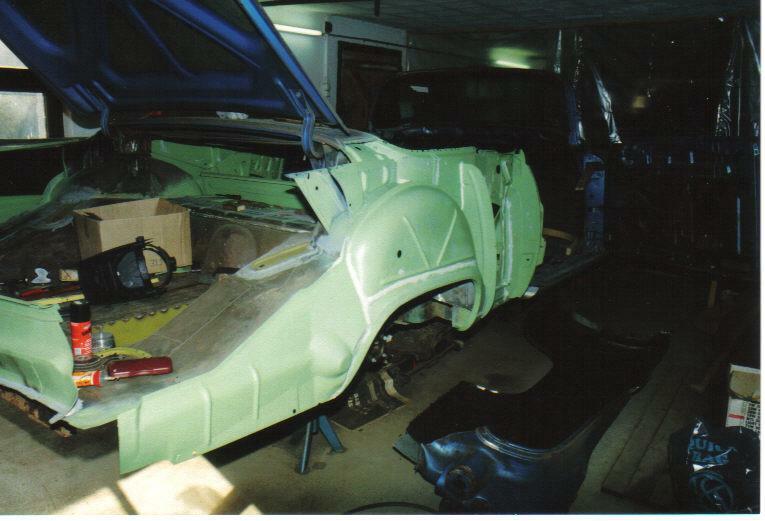 I don't think any car is beyond restoration if you have the skills, time, and funding to do it. You are a true artisan...in multiple scales. I wonder, if in 300 years or so, will someone restore your Mark II model? Thanks for the kind words! Well, if somebody will want to restore the Mark II model, I'm wishing a lot of luck. As you probably saw, I intended to just improve a bit the Toronado model and I'm going from trouble to disaster! 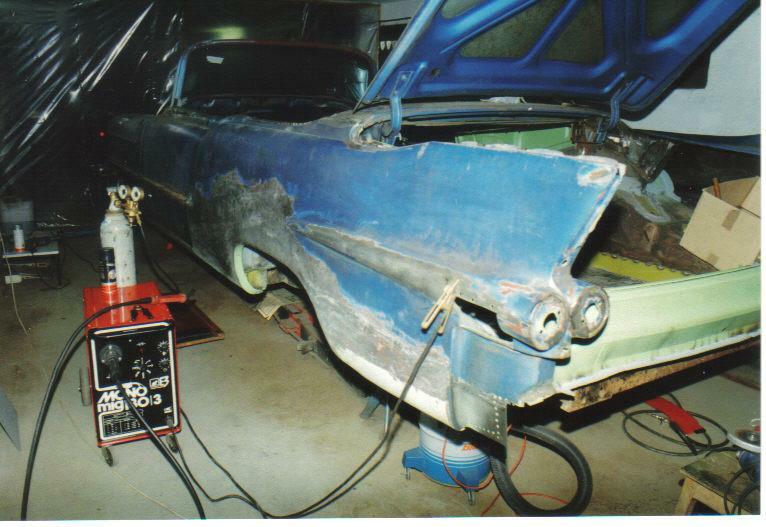 Trouble to disaster sounds about right for any restoration... at least the ones I do. When I was in the Boy Scouts, I was told "A scout smiles and whistles under all difficulties". Have you ever tried smiling and whistling at the same time - it's impossible! 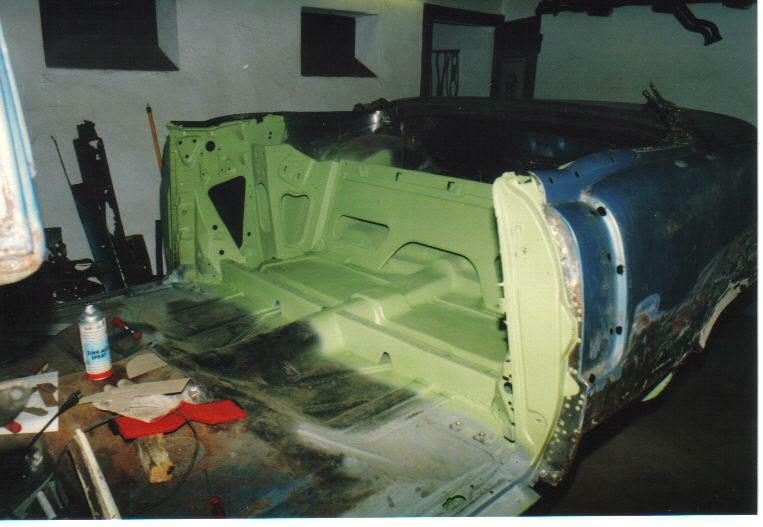 After the floor was ready, I could weld in place the outside rocker panel. The rear fender is not yet welded on the body; during the work at the front, I put the fenders on the body to spare some space. During August 1994, the rear compartment was ready and primed. Suddenly, there are less parts lying on the floor. To see them in place is making a good feeling. It's necessary with such a project! 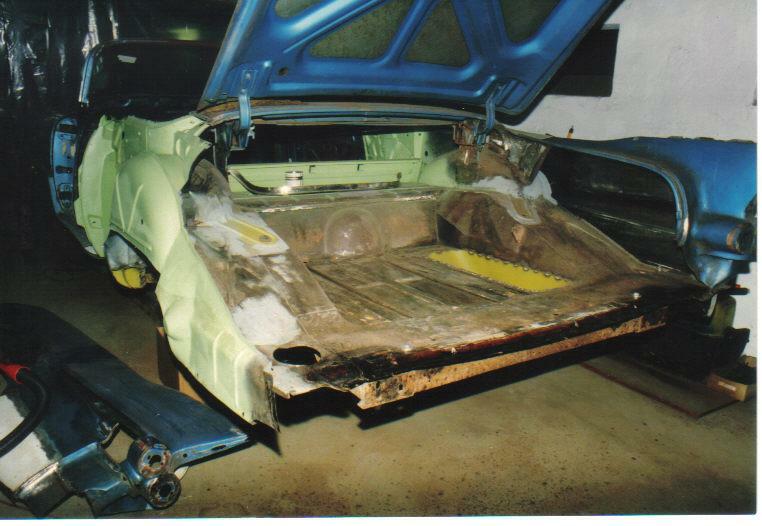 The panel between the trunk lid and the floor had some rust spots. I had to remove that panel for repair. The same original Biarritz panel was too rusty to be rescued. 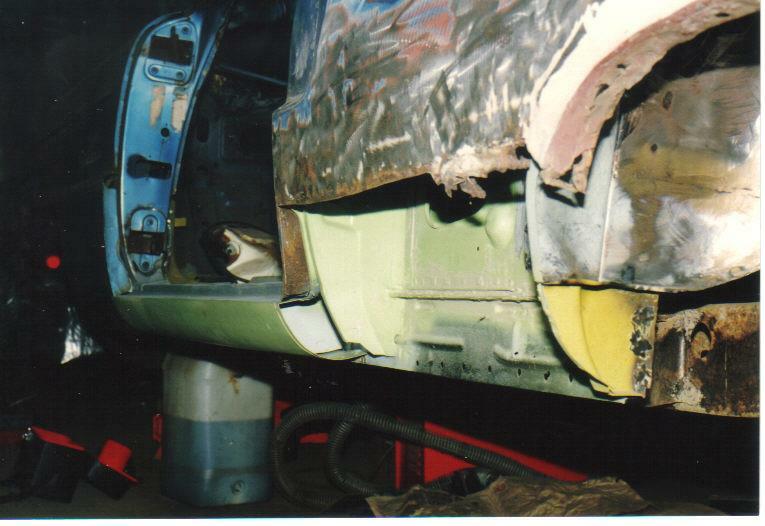 The LH rear fender is again on the floor; some work was done on it: I could rescue the lower part from the de Ville floor and, with some modifications, weld it to the main fender. It's the reason why the bottom of the fender is white. About at the same time, I had to cut the lower corner of the windshield. I could get another part from the de Ville to do a proper repair. The windshield in the background was broken, but still needed for the alignment of the "new" lower corner. 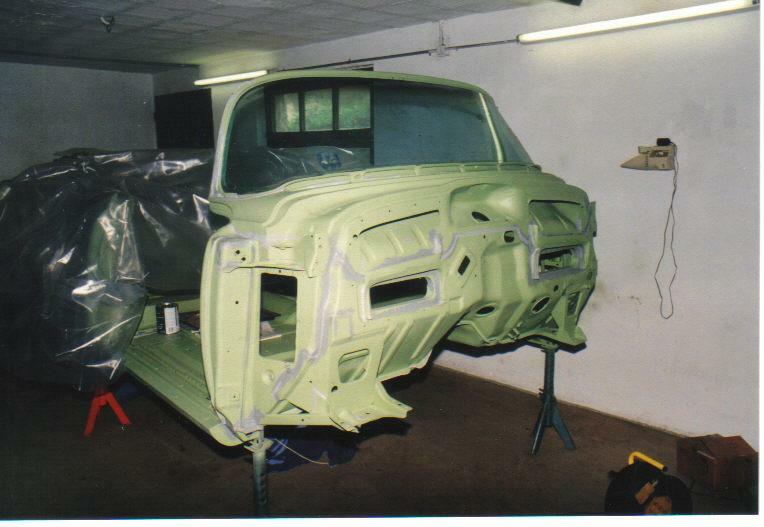 From your photographs and description you make it look reasonably easy but, I know the blood, sweat and tears, that go into a body shell restoration like yours. Yes Mike! Most probably if I had a digital camera at that time, that report would be more detailed with all the good and not so good aspects of the body work. In retrospect, it was a great adventure! 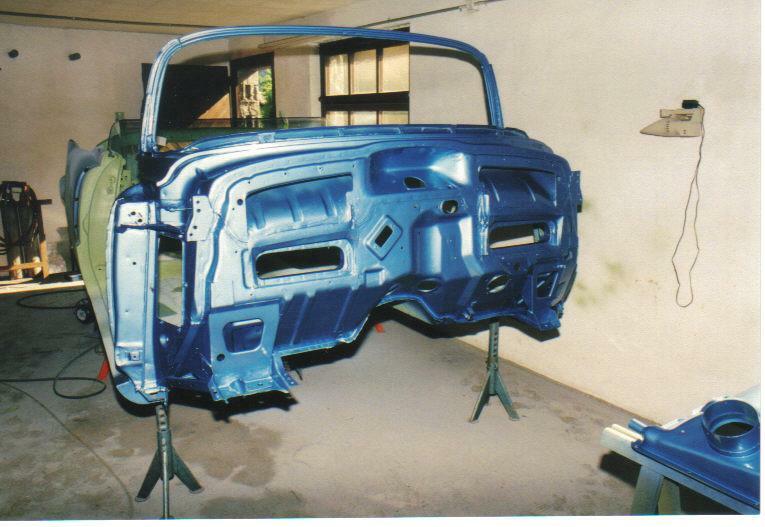 It amazes me that you have such good photos from your Cadillac restoration. At that period, I never managed to take many photos of the things I did, or restored. It always seemed so expensive getting photos printed at that time. Digital cameras have made life so much easier for recording our work. Although I still do not own a smart phone, I am amazed at the quality of the photos that they produce with such a small camera in the phone. 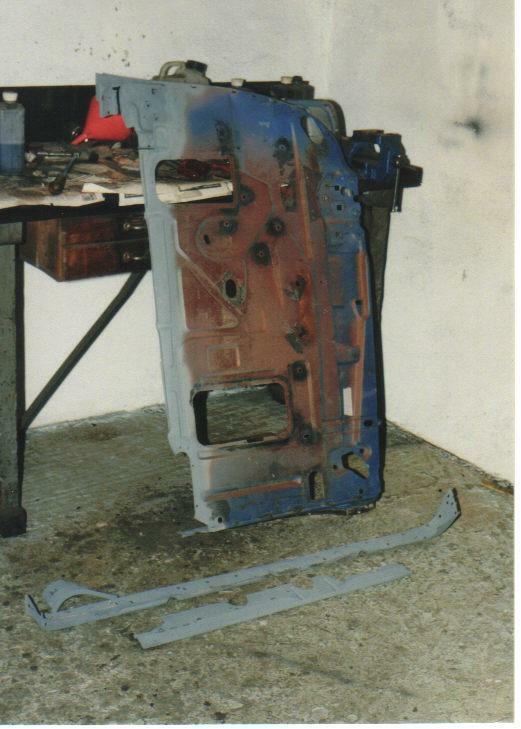 I just mentioned about the 'blood, sweat and tears' to make readers, who have never worked on 'rusty old cars', aware of the excellent work you did on this rebuild. 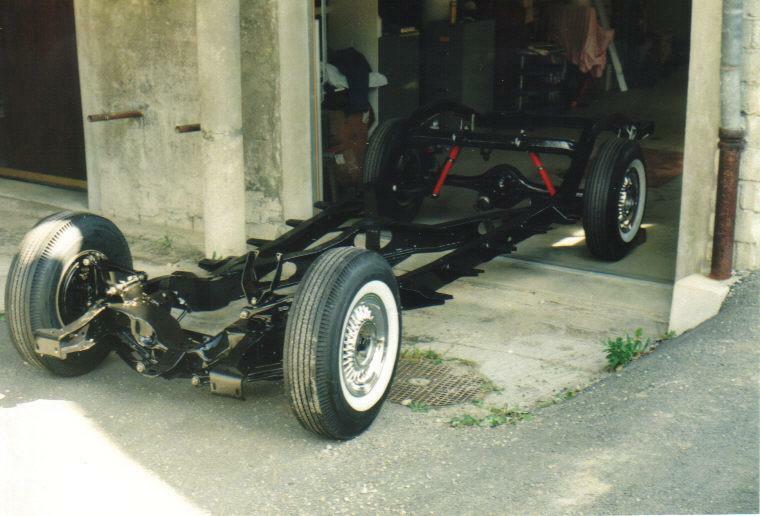 In July 1995, the rear fenders were ready. It was not an easy task to form the lower part (the one that was eaten by the rust) with a correct flange for the wheel opening. My friend did the RH rear fender, and then he had some trouble with the police and his drinking habits. Therefore, he could not come anymore as he was without a driving license for some months. Fortunately, I could learn a lot with him and I did the repair for the LH rear fender. As everybody knows, to weld a steel piece in the middle creates a lot of heat with the mandatory distortions. 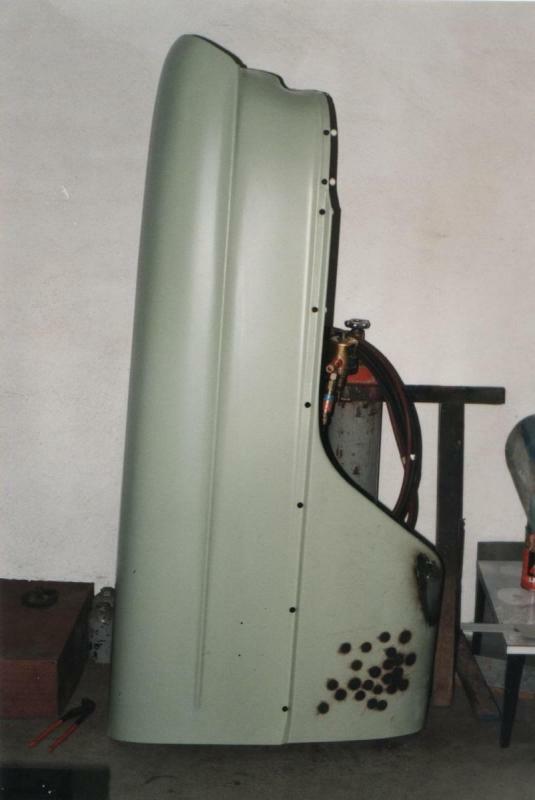 These distortions had to be corrected before the rear fenders were welded on the body; otherwise, some spots could not be reached any more from behind. Those who are familiar with sheet metal know what I'm speaking about. 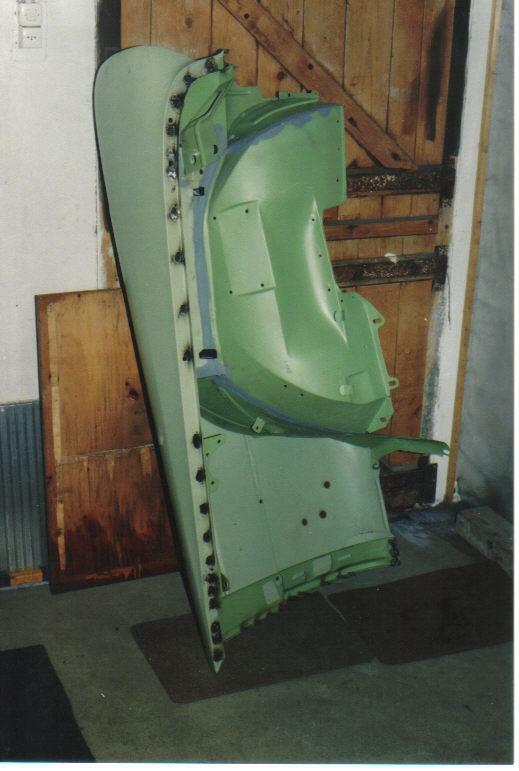 The second picture shows the LH fender which is ready to be welded on the body. A great moment! To avoid too much dirt on the other cars, I put some clear plastic as a separation between the working space and the storage space. It was not perfect, but good enough. 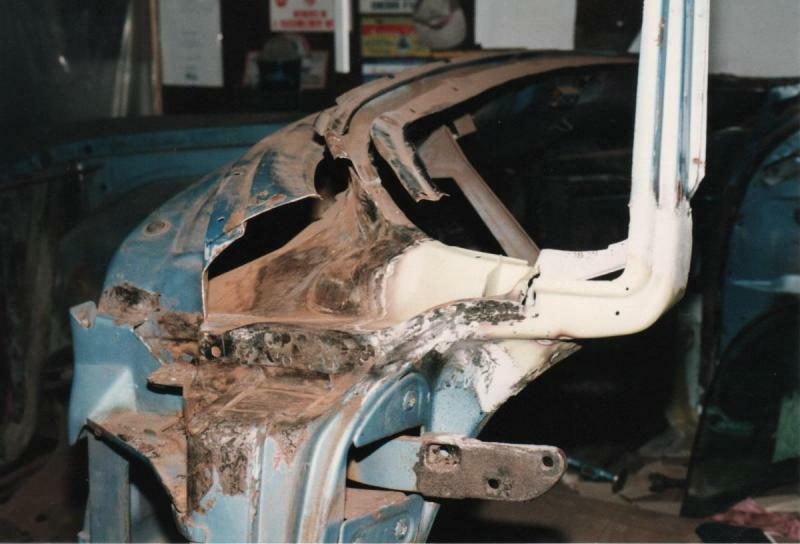 When the body was repaired, it was time to remove the frame. I had plenty of opportunities to have a good look at it and, fortunately, he was intact. No rust holes, no major damages. At least something very positive. 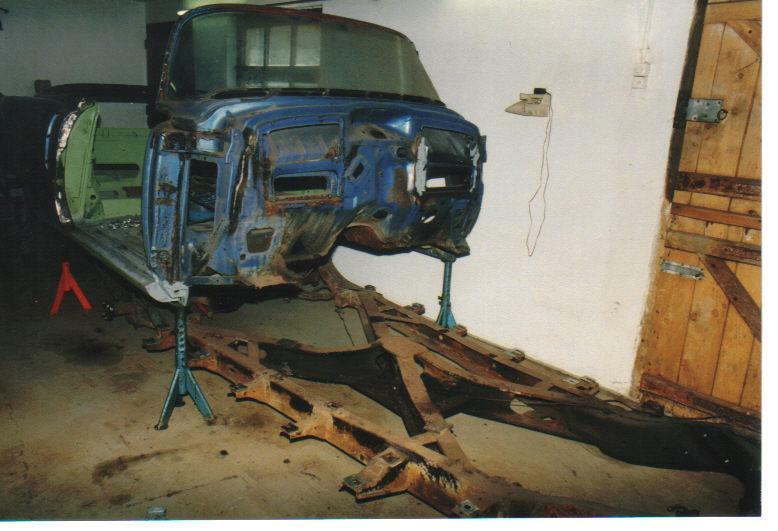 To separate the frame from the body, I lifted the whole unit as high as I could, removed the about 20 screws and then I began to lower the frame with a floor jack. It takes time, especially when working alone. The pictures were done in August 1995. Looking good!!!!!! I know the feeling of working alone. Now, body and frame are next to another. By chance, the room is wide enough! 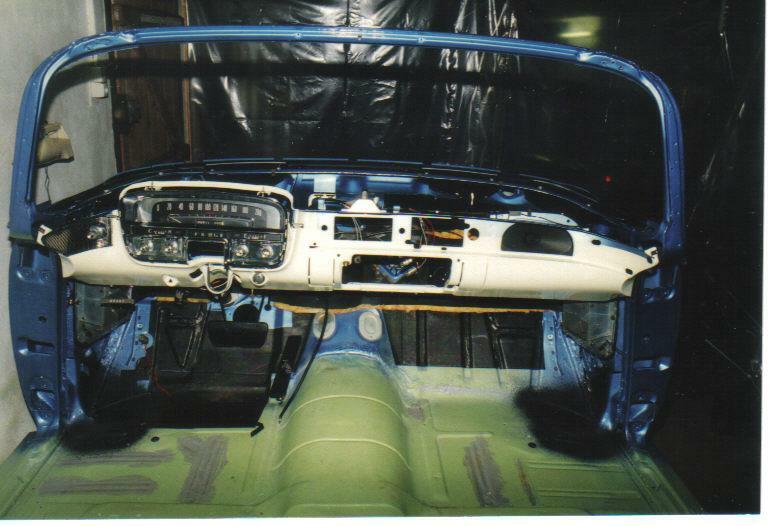 Once the frame was put on side, I could begin to clean the underbody. What an ungrateful job! 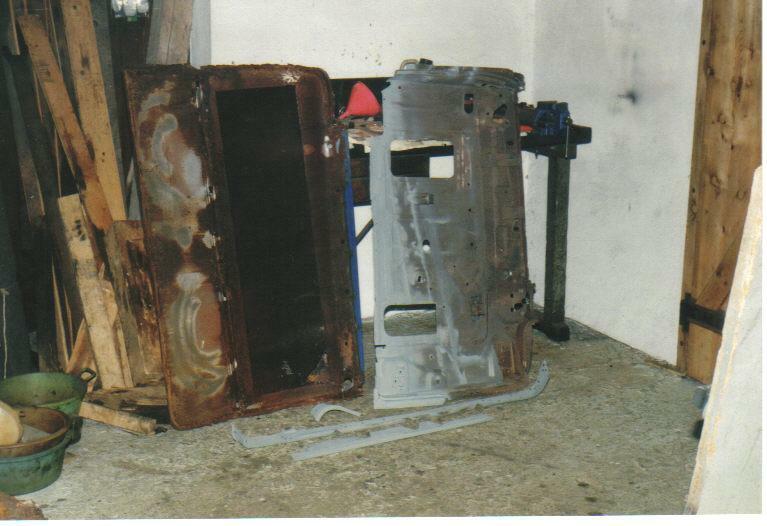 Even with new pieces welded as well as the ones prepared outside, there was still a large surface not yet touched. As I have no water in that place, I was not the nicest one after a cleaning session. Fortunately, the home drive was no longer than half an hour! As I wrote earlier, there is no heater in that room. There is a minimum temperature to paint parts with a 2 components product. 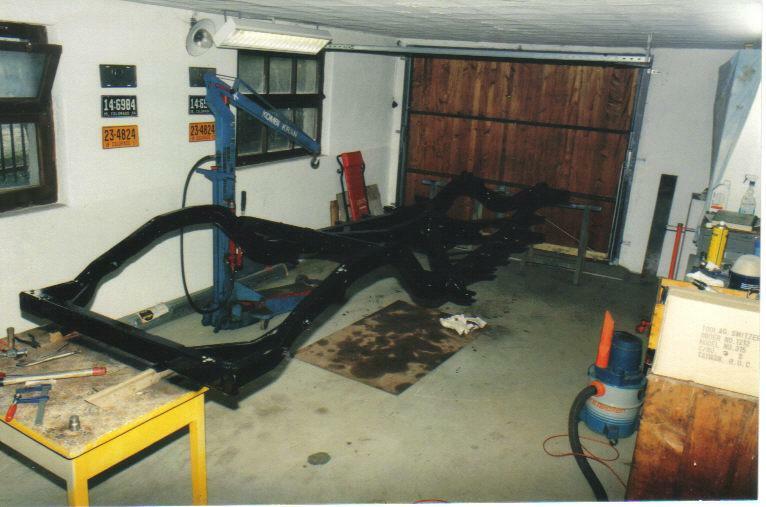 By chance, I could prime the underbody in October, before it was too cold. During springtime 1996, the firewall was sealed. The color coat in not far away! As everybody knows, a car is not only a frame and body. There are also mechanical little things which permit the thing to move. 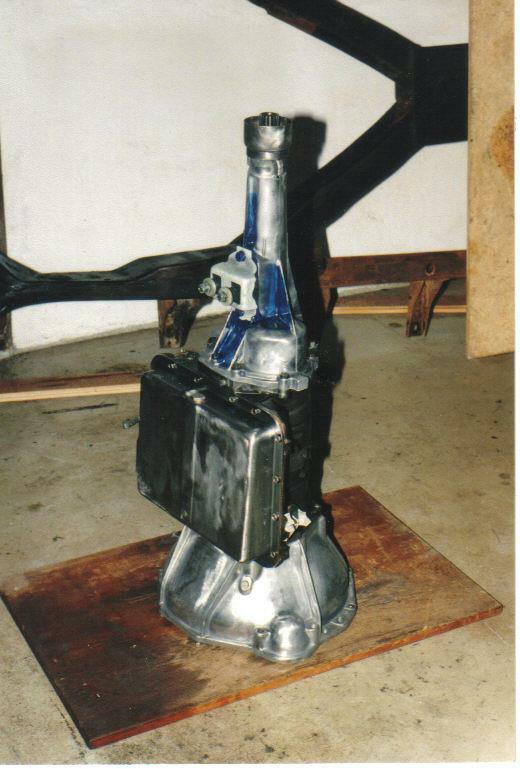 Once I had all the parts for the engine, the block was sent to a mechanical shop to bore it, adjust new pistons (.030 oversize) and grind the main journal of the crankshaft at .010. I did myself the remaining assembly; unfortunately, I have no pictures as I had some for the same work on the de Ville and Brougham. 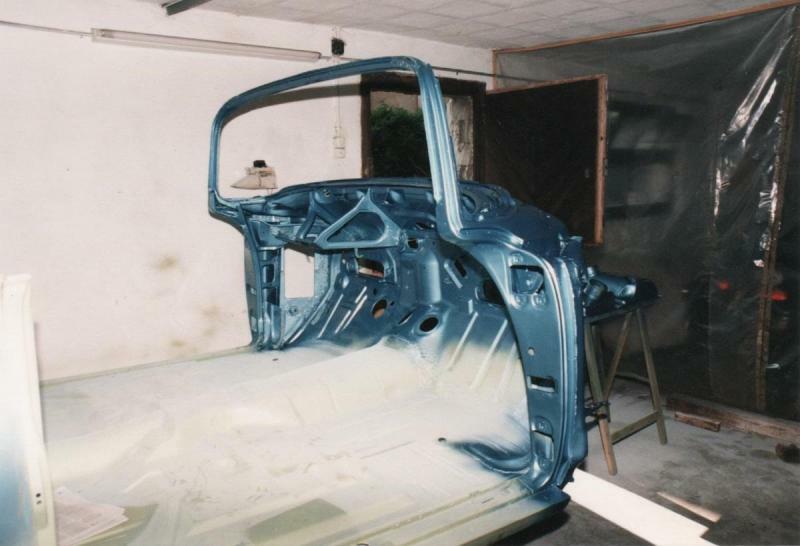 On June 8, 1996, I could apply a color coat to the firewall. 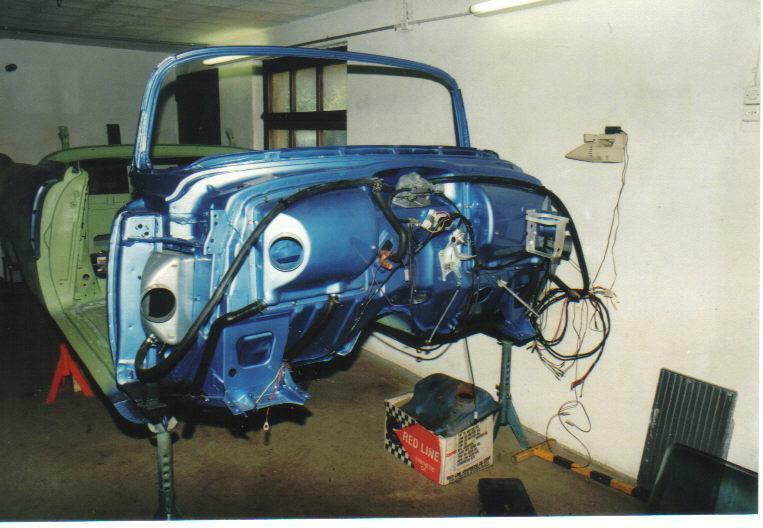 When the firewall is painted, it means that the assembly of revised or new parts is not far away! 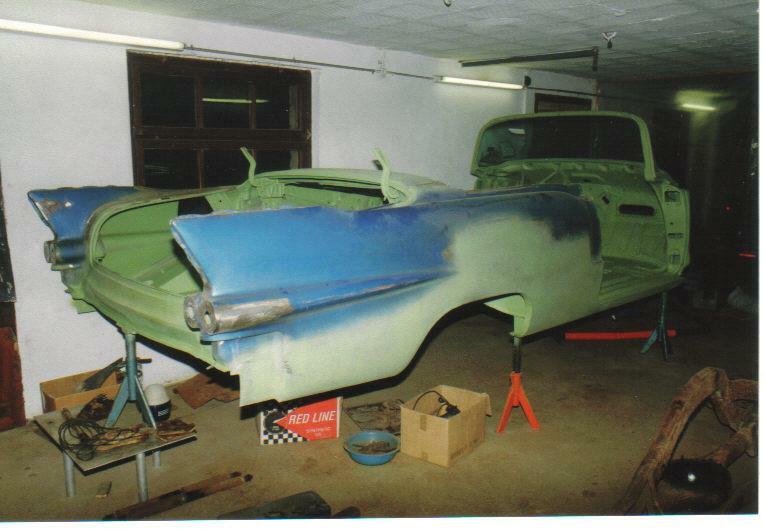 During the same period, I began the work on the front fender. The ones on the cars were not bad looking at first glance. Unfortunately, they had been "protected" with a heavy coat of underbody material. It was a stupid investment: the water flowed at the joints in the motor bay and could not escape due to the thick material. 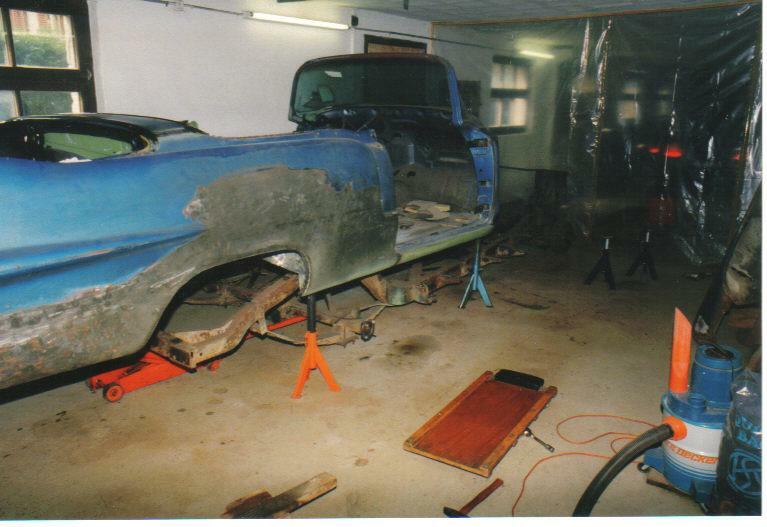 The result: rust again. 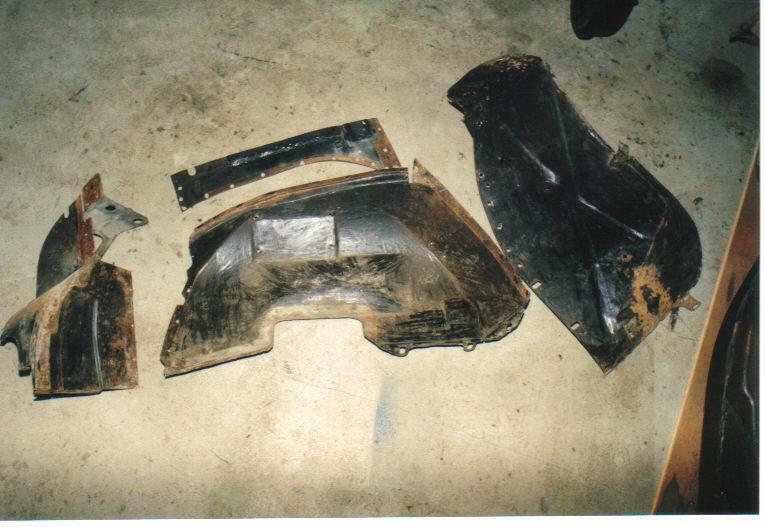 With 2 other front fenders, I could rescue enough pieces to have a pair of inner wheelhouses. 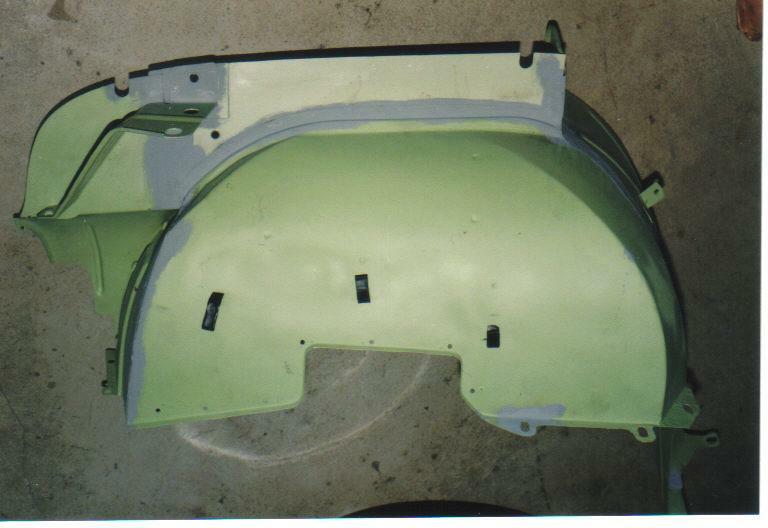 The separate parts were sandblasted and primed prior to assembly by welding. 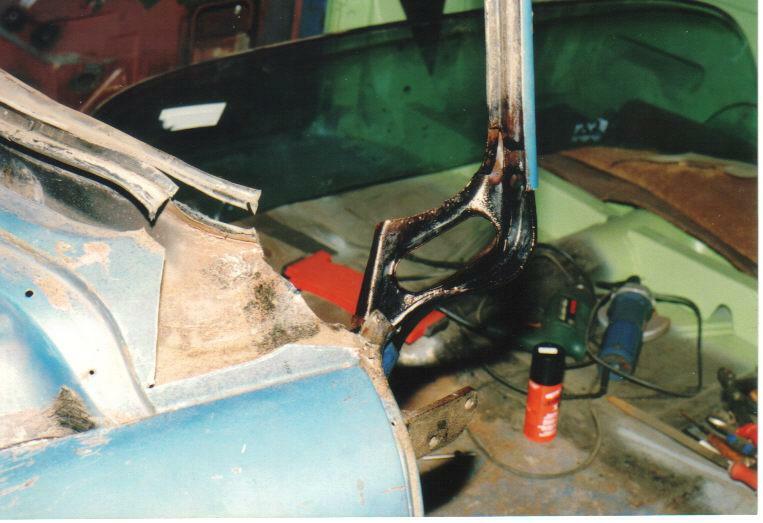 Once the wheelhouses ready, the next task was to weld them to the front fender, as shown. As noted earlier, the frame was in excellent condition. There was some surface rust at the rear of it, but nothing serious. A good friend with a truck and proper equipment to load it on the bed forwarded it to the company who did the sandblasting and primer. Of course, the good friend took it back to my shop when the frame was ready. I have to admit that the black coat on the frame is not my best job...But, who cares? Bit after bit...Now the frame is almost completely assembled. 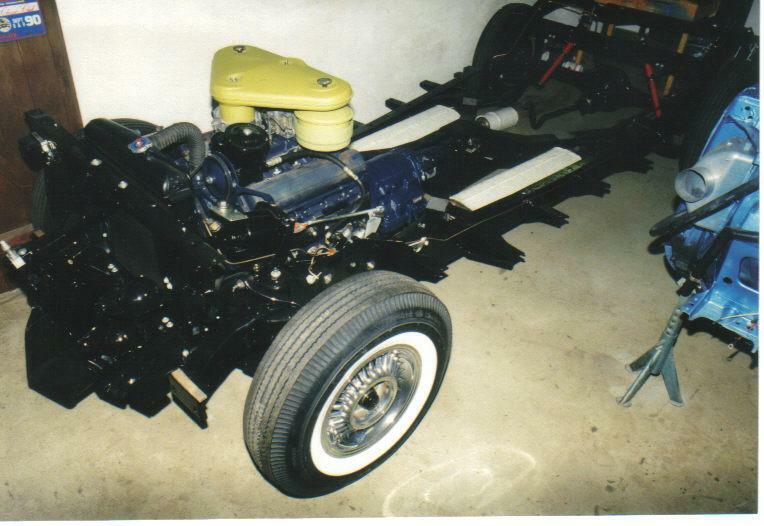 The front springs are not yet installed as I need the weight of the engine to install them without too much trouble. I'm especially satisfied with the wheels. I could almost write a book in regard to the plating of the 5 wheels. First, I sent only one wheel to a known plater in the USA, country of unlimited possibilities. It was not cheap (it's a Cadillac after all); when plated, the wheel was sent to an hotel in the States: I was there for 5 weeks for GM. In my luggage, I took 2 other wheels to send to the plater. When the plated wheel came to the hotel, I was really nervous to see what was done. It was a huge deception. On the visible part, the chrome was good; however, it was already peeling at the back! I don't remember exactly what was done with the plater; anyway, all the wheels came back to Switzerland and I got no refund. I took contact with a plater in Switzerland and showed him the "good" work made in USA. He suggested to do again the wheel already plated and as I had 5 of them, he could construct a device to have a good chrome plating. After some months, the wheels were done and it was fantastic. Also expensive, but a much better quality of what I had from the States. Dear American people, I will do now a nasty remark: you may have the best products in the world, but why most of your companies are unable to repair components correctly ? It could be because there are more artisans in Europe than in the US, with a longer tradition, who knows. I tried several time to have something repaired in the US, it was most of the time a disaster. Another example: during vacation in Florida, I took the Delco-Moraine brake booster with me to let repair it at one of the advertisers in Hemmings. The booster came back to Switzerland after a while, very good looking. I was curious to see what would happen with some brake fluid in it. I poured some fluid and pumped the rod. I don't know what happened inside: no oil came out. After disassembly of that booster, I saw lots of RTV sealant and a mess inside. At the end, I did the repair myself. Why had I the stupid idea that Americans can do it better? It's now time to install the various little parts cleaned or plated. After a while, the firewall is ready. The speedometer was in miles; I let engrave a plexiglass plate with km. The odometer stays in miles. Dear American people, I will do now a nasty remark: you may have the best products in the world, but why most of your companies are unable to repair components correctly? At the end, I did the repair myself. Why had I the stupid idea that Americans can do it better? I wonder this myself Roger... I see a lot of shoddy work and it drives me crazy. I just do as much as I can myself so I know its done right. 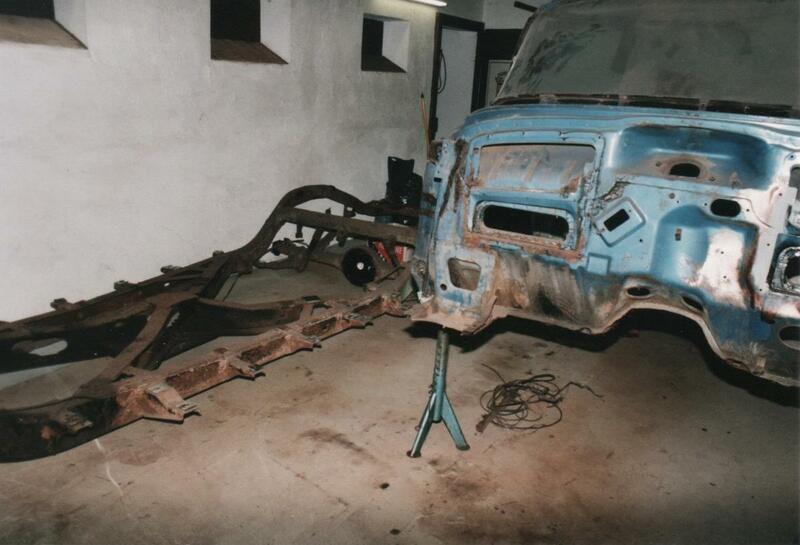 Very disappointing to get shoddy work or a flimsy replacement part when you put so much work into a restoration. Sometimes I think making $$$ is all that counts here in the US for many individuals, not the quality of work you produce. Great looking Cadillac, I am enjoying your posting! My father had a Caddy, '57 painted in "dusty rose" otherwise know as pink! I agree, Roger. My experience has been the same, and I'm American. I think the problem is a lack of character and integrity, a little greed, general lack of caring, a little lack of knowledge, a reluctance to learn from one's mistakes, a lack of pride, lack of shame, loss of craftsmanship, lack of consequences for poor performance, and some general laziness. That being said, there ARE great shops out there in the USA, it's just that only about 15% of the shops are great. I found a great chrome shop, but not before I found a really really bad one. I found two good mechanics, but after 4 bad ones. I found a good water pump rebuilder, but after a bad one. You get the idea. I think the best way to handle this in the future is to always ask around your car friends and club members, and the cream of the crop will always come up in conversation. Just because they advertise in Hemmings doesn't mean they are any good. Really enjoy the postings, even with the insults (all true!) of your American experience. Let's hope we are entering a new era of American craftsmanship, like we used to have. As I wrote in another forum, for 20 years it was difficult to ask for past experiences, especially when one is living outside the US. Nowadays, that task is easier of course. Nevertheless, to be honest, I had/have also good experiences in the US: Klaus Vokak with his antennas (he is now retired) and Terrill Machine who did many water pumps for me. There may be a few others, but I don't remember. There is clearly a problem here (US) but it probably isn't to the extent you see/hear. The people that are doing the really good work and are generous with their time and put others first are here... they're everywhere, but you don't hear about them. You might not often run across them. The general public tends to act like what the hear about, and as long as what we hear about is garbage, well... I'm afraid people don't have a lot of incentive to do differently. One day in the future the pendulum ball will swing back towards the great things that people here and around the world do and I do look forward to that day. Until then I'll keep doing the best I can and enjoy the fine efforts and generosity of my fellow forum members. Roger, when I see the latest pictures I do believe I have a similar amount of disbelief as I did seeing your model progress. I know a good bit of time transpired between the images you have for us, but even considering this it is a lot of accomplishment. I was not yet completely ready with sheet metal: the doors were waiting. The ones on the car were really bad. 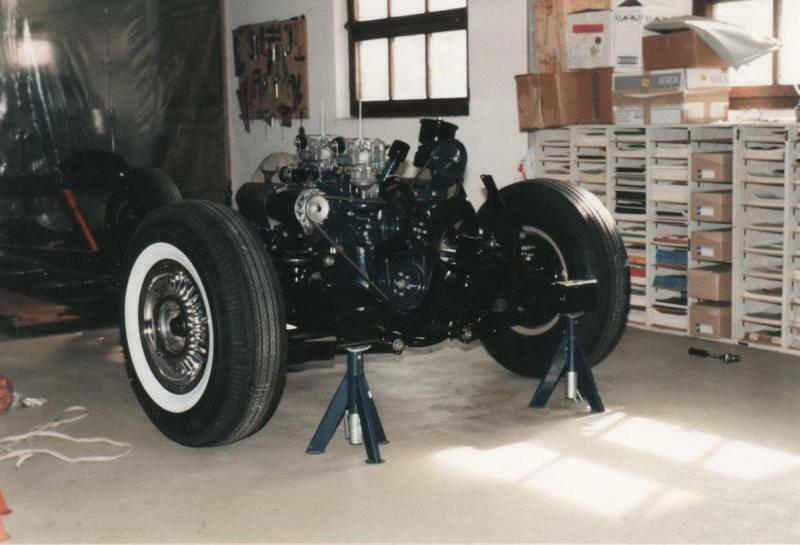 I contacted a known supplier in the USA; (he does advertise in the Self-Starter, the Cadillac club magazine) he said that he had a good pair of doors. I asked again about rust and he said that he spent the whole Sunday with his son to inspect them and they are excellent. OK, please ship them! Well, I don't know what for glasses he had at the time; maybe the ones to observe a sun's eclipse: they were as bad as mines (or they rusted in the plane between USA and Europe). So with 4 doors, I could do 2, but I had to weld some new sheetmetal; the lower outside panels were also made from scratch for both doors. Are you surprised if I don't buy anything anymore at this location?